Yuvraj Singh has stated that he enjoys playing cricket at the moment and would go on to play until he does that when he was questioned about his retirement plans. He also opened up about his discussions with Sachin Tendulkar, which have helped him survive through the ups and downs in his form. 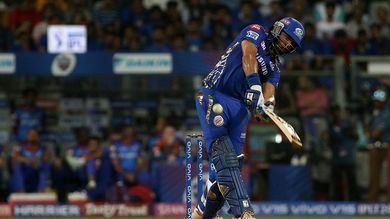 Veteran India batsman Yuvraj Singh made a good debut for Mumbai Indians on Sunday, as he scored 53 off 35 balls against Delhi Capitals. The batsman last played an ODI for India in 2017 and had an underwhelming IPL last year as well, where he only managed to score only 65 runs in eight matches, for Kings XI Punjab. While his place in the World Cup squad is a distant call, the 2011 World Cup hero has said that he will continue playing as long as he will be enjoying it. "The last two years, have been up and down (for me). And I could not decide on what to do and the main thing was that why I played the game when I started playing the game, I played the game because I enjoyed playing cricket. When I enjoyed playing cricket, I was not playing for India, I was playing for U-16, U-14. So till the time I enjoy playing cricket, I am going to play, said the 37-year-old, at the post-match press conference of his team’s match against Delhi Capitals. The southpaw also opened up about his conversation with batting legend Sachin Tendulkar, who had also suffered a dip in his form in the final years of his career and played until the age of 40 before international cricket. "When the time comes, I will be the first one to hang my boots. I have been speaking to Sachin (Tendulkar) as well and he has gone through that time when he was 37-38-39 (and how he felt). Talking to him makes things easier for me. And I'm just playing because I enjoy playing cricket pretty much," he said. The Rohit Sharma-led side had their task cut out, as they were chasing a huge target of 214 runs. The openers Rohit Sharma and Quinton de Kock looked promising as the scoreline read 33/0 after 3.2 overs. However, Sharma then fell for 14, which triggered a fall of wickets and did not help Mumbai Indian's cause. Though Yuvraj tried to stitch a partnership for the sixth wicket along with Krunal Pandya it did not last long as Pandya fell for 32. Eventually, Yuvraj went down after a fighting knock of 53 in the 19th over, which sealed the match for the opposition. "I took my time there. The wickets were falling and I thought if I take chance early, we (don't) want to end getting close to the game, so I just took my time. I am happy with the way I was hitting the ball," he expressed.